The map below shows the two main abra routes, the abra stations, nearby tourist attractions, and more. 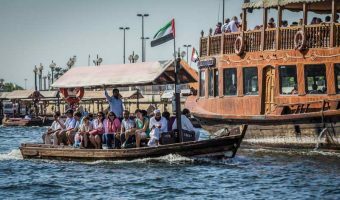 Attractions and places of interest near the abra stations include the Bastakia Quarter, Deira Fish Market, the Dubai Museum, the Heritage and Diving Village, the Old Souk, Perfume Souk, the Sheikh Mohammed Centre for Cultural Understanding, and the Spice Souk. Click on any icon on the map for additional information.